Model Creator is a simple and easy to understand 3D modeling program, designed to create 3D models you can use in Game Maker. The program saves the models using the Game Maker format, so they can be loaded directly into your game using the function d3d_model_load. 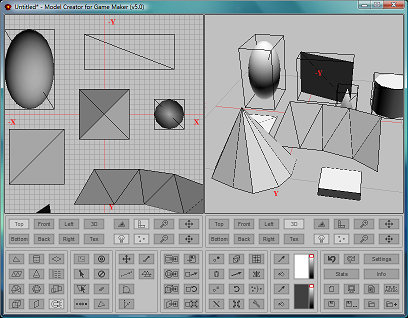 Model Creator is made with Game Maker, I used Max WinAPI 2 (a DLL created by Hobbel) to create Windows dialogs. Model Creator is completely free. No credits are required. If you want to give credits anyway, just write something like "Models made with Model Creator" or show a link to this page. If you want to make a download link, please link to this page. Model Creator v5 by Maarten Baert is licensed under a Creative Commons Attribution-Share Alike 2.0 Belgium License. If you want to redistribute the original or a modified version of Model Creator v5, you must include my name (Maarten Baert) and a link to this page (http://www.maartenbaert.be/model-creator/).